World Humanitarian Day takes place every year on 19th August to recognise aid workers who risk their lives every day in adverse situations to help people most in need. It commemorates the 2003 bombing of the United Nations Headquarters in Baghdad, Iraq, which killed 22 people. It provides an opportunity to recognise the efforts of humanitarian workers all around the globe who work tirelessly every single day, and the commemoration also pays tribute to those who have fallen while helping people in need. Last year, the #NotATarget campaign saw world leaders, humanitarian workers and the public banding together to advocate for better protection of civilians and humanitarian workers in conflict zones. This year, building on the momentum of the 2017 campaign, the United Nations Office for the Coordination of Humanitarian Affairs (UN OCHA) and creative partners have designed another global digital campaign. Images of people’s faces, names, and locations will be projected onto screens and sculptures, forming a “living petition”. These superimposed faces will address the public and world leaders at the UN General Assembly, thereby giving a voice to civilians caught up in conflict. Through the act of bearing witness, the campaign hopes to push policy and decision makers to action. However, violence against the humanitarian community has not abated. Just recently, a UN Children’s Fund (UNICEF) driver was killed while he was transporting education supplies in South Sudan. Unknown gunmen had fired on his convoy, even though the vehicles were clearly marked with the UNICEF logo. What is worrisome is that this is far from an isolated event; despite awareness-raising campaigns such as #NotATarget, an alarming number of humanitarian workers are still the targets of attacks and threats while in the field. Data from Insecurity Insight indicates that between July 2017 and March 2018, 330 aid workers were killed, injured, kidnapped or assaulted. This figure only represents reported cases and does not even take into account undocumented incidents. Much more needs to be done by the international community to move beyond rhetoric. Consensus on the issue has not automatically translated into action. Perpetrators of attacks on humanitarian workers frequently go unpunished. This is because humanitarian organisations are often not in the position to invoke accountability and justice mechanisms. There is also the issue of the burden of proof. Attacks tend to be conducted by unknown assailants in remote and isolated areas. This makes it difficult to ascribe blame and identify the offenders. The truth is, if these transgressions go unchallenged, belligerent parties will continue to act with impunity. The onus is therefore on the international community to challenge this impunity and demonstrate a resolve to hold these parties accountable. 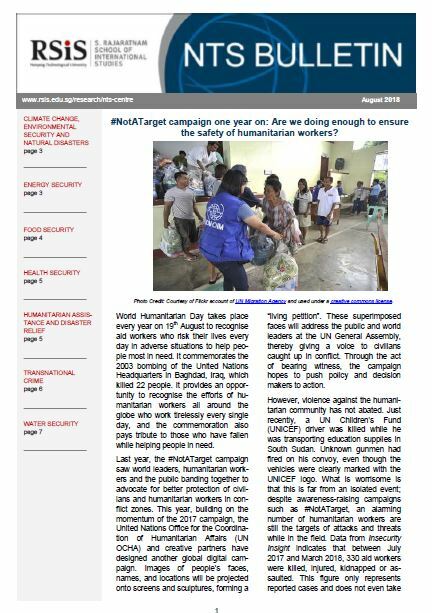 Targeted attacks on aid workers pose an operational dilemma for humanitarian organisations; they must balance between the desire to provide aid for vulnerable populations, and the need to ensure the safety, security and well-being of their staff. This jeopardises and complicates the delivery of assistance to those in need. The UN, international organisations like the ICRC, and states need to work together to enforce the rule of law. Tangible action must complement the normative push towards the ending of violence against aid workers. The international community as a whole should call on parties to the conflict to uphold their obligations under international humanitarian law, take tough punitive action on wrongdoers, and invest in technology that allows for the documentation and preservation of evidence. All these measures go a long way in deterring potential perpetrators from committing acts of violence against humanitarian actors. Insecurity should not be the new “normal” for humanitarian action.